These clips illustrate the variety of teaching and assessment practices used by history teachers, from traditional lectures and discussion classes to new media. They underline the strong belief that there is no one-way to teach history, but also the emphasis upon learning history as an inquiry-led and hands-on experience and the power of ‘learning by doing’ in a variety of contexts inside and outside the history classroom. 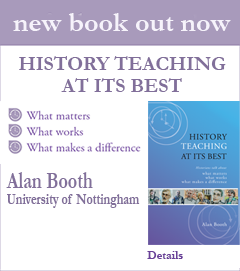 They demonstrate that history teaching at its best links subject to student and society in ways that can transform understanding of all three, and that teaching is a human endeavour as much as a matter of technical mastery.